As a boy, I remember my family leaving Indianapolis, IN, heading to Los Angeles, CA to visit friends. We got on ROUTE 66 in Mitchell, IL and crossed the Mississippi River on the Chain Of Rocks Bridge. I remember being awe struck by the 22 degree turn in the bridge. I remember passing the now famous Coral Court Motel and the Chain of Rocks Amusement Park just outside St. Louis, MO, that have since been demolished. I remember the Merimac Caverns in Stanton, MO. 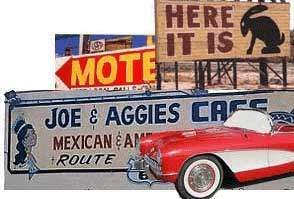 I remember going west on ROUTE 66 and all the Mom & Pop diners, the family owned one story motels, the road side attractions, roadside picnic tables where my Mother cooked most of our meals on a Coleman 2 burner stove and how those passing would wave and blow their horns in greeting. I remember the Burma Shave signs, a huge round red barn, the giant Jack Rabbit sporting a saddle and a big sign “Here It Is”. I remember seeing buffalo grazing in the fields. I remember the full service filling stations where gas was 21 cents a gallon. I distinctly remember how beautiful the city of Albuquerque, NM was. I remember my Dad installing an ice cylinder on the passenger side window of our new 1953 Ford to provide cool air while crossing AZ. I remember the canvas water bags on the fronts of the vehicles to refill the radiators. I remember arriving in Santa Monica after traveling all those miles on ROUTE 66 and we never had to look for another highway the entire way because ROUTE 66 was the Highway.